In terms of news about DDoS attacks, the last quarter of 2017 was livelier than the previous one. Some major botnets were discovered and destroyed. For instance, early December saw the FBI, Microsoft, and Europol team up to knock out the Andromeda botnet, in operation since 2011. In late October, the Indian Computer Emergency Response Team (CERT) issued a warning about a massive botnet being assembled by a hacker group using the Reaper and IoTroop malware; earlier that same month, the spread of Sockbot through infected Google Play apps was detected and terminated. Besides the various battles with Trojan-infested botnets, the last three months of 2017 were dominated by three main DDoS trends: politically motivated attacks, attempts to cash in on the soaring price of Bitcoin, and tougher law enforcement. Politically motivated DDoS attacks remain eye-catching, but fairly ineffective. In late October again, during parliamentary elections in the Czech Republic, the country’s statistical office was hit by a DDoS attack in the middle of the vote count. The attack was a nuisance, but nothing more, and the results of the elections were duly announced on time. But politics is politics, and business is, well, just that. As we noted in the previous quarter, Bitcoin and everything associated with it has hit peak commercial popularity — not surprising, considering the explosive growth in its value. No sooner had Bitcoin spawned a new kind of cryptocurrency in the shape of Bitcoin Gold (BTG) than BTG sites immediately came under DDoS fire. After the price of the cryptocurrency took off in November, DDoS attacks rained down on the Bitfinex exchange — apparently with the aim of profiting from Bitcoin price fluctuations caused by denial of service. Still punch-drunk from the November attack, Bitfinex was paralyzed by two more onslaughts in early December. On the topic of total failure, it would be amiss not to mention the shutdown of four shadow markets in the deep web used for all kinds of illegal trade: Trade Route, Tochka, Wall Street Market, and Dream Market. They have been operating erratically ever since October. It wasn’t clear at first what was behind these massive, well-coordinated attacks: the law enforcement agencies (as in the recent destruction of AlphaBay and Hansa) or competitors attempting to encroach on their territory. The subsequent attacks on all other trading platforms in early December dispelled most analysts’ doubts that it was a full-scale cyberwar between drug cartels. However, the law — in particular, the judicial system — is not sitting idly by. Q4 saw a whole host of charges and sentences handed down in DDoS-related cases. The US judicial system was the most active: in mid-December, three defendants, Paras Jha, Josiah White, and Dalton Norman, confessed to being the brains behind the Mirai botnet. And in late December, the founders of the notorious hacker groups Lizard Squad and PoodleCorp — Zachary Buchta of the U.S. and Bradley Jan Willem van Rooy of the Netherlands — were convicted. In Britain, the high-profile case of young hacker Alex Bessell from Liverpool went to trial. Bessell was recently jailed for having launched a series of major cyber attacks in the period 2011-2013 against such giants as Skype, Google, and Pokemon. An even younger British hacker who targeted NatWest Bank, the National Crime Agency, Vodafone, the BBC, and Amazon was handed 16 months’ detention, suspended for two years. A curious incident concerned 46-year-old John Gammell of Minnesota, who was charged with hiring three hacking services to create problems for his former employers, the websites of the judicial system of the district where he lived, and several other companies where he was once a contractor. The sponsors of DDoS attacks are often hard to track down, but Gammel couldn’t resist the temptation to tease his targets with emails — which led to his capture. As the investigators reported, the hacking services dealt with Gammel very professionally and cordially, thanking him for procuring their services and even upgrading his membership. Q4 demonstrated that DDoS attacks can be categorized as persistent online “crosstalk.” Junk traffic has become so widespread that server failure from too many requests might not be attack-related, but the accidental result of botnet side activities. For instance, in December we logged a huge number of requests to non-existent 2nd and 3rd level domains, which created an abnormal load on DNS servers in the RU zone. A modification of the Lethic Trojan turned out to be the culprit. This long-known malware comes in many different flavors, its main task being to allow spam traffic to pass through infected devices, basically like a proxy server. The version we discovered was unlike most modifications in that it operates in multiple threads to create a huge number of requests to non-existent domains. The study found that this behavior was an attempt to mask the command-and-control (C&C) server addresses behind numerous junk requests, and the excessive load on the DNS servers was simply the result of the malware’s poor design. Nevertheless, DDoS attacks on DNS servers using junk requests are quite common and easy to implement. Our experts have assisted clients in many such instances. What’s interesting here is the method employed, as well as the perhaps unintended effect. 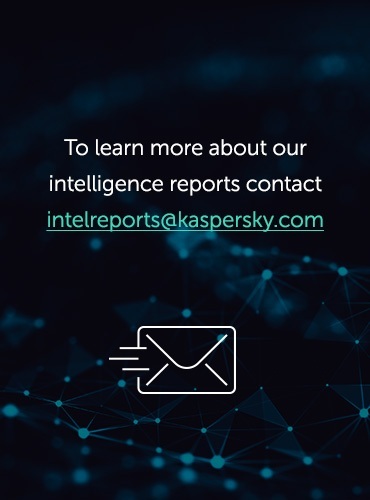 Being part of the Kaspersky DDoS Prevention solution, the DDoS Intelligence system intercepts and analyzes commands sent to bots from C&C servers and requires neither the infection of any user devices, nor the actual execution of cybercriminals’ commands. This report contains DDoS Intelligence statistics for Q4 2017. 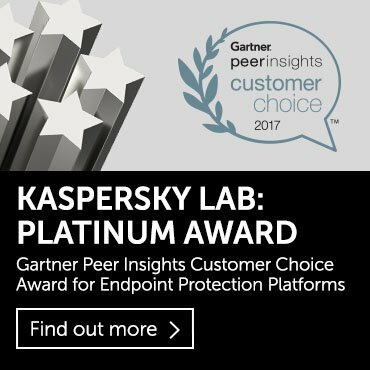 DDoS Intelligence statistics are limited only to those botnets detected and analyzed by Kaspersky Lab. It should also be noted that botnets are just one of the tools for performing DDoS attacks; thus, the data presented in this report do not cover every single DDoS attack that occurred during the specified period. In Q4 2017, DDoS attacks were registered against targets in 84 countries (98 in Q3). However, as in the previous quarter, the overwhelming majority of attacks occurred in the top ten countries in the list (94.48% vs. 93.56%). More than half of all attacks in Q4 (51.84%) were aimed at targets in China — almost unchanged since Q3 (51.56%). In terms of both number of attacks and number of targets, South Korea, China, and the US remain out in front. But in terms of number of botnet C&C servers, Russia pulled alongside this trio: its relative share matched China’s. The longest DDoS attack of Q4 2017 lasted 146 hours (just over six days). This is significantly shorter than the previous quarter’s record of 215 hours (almost nine days). 2017’s longest attack (277 hours) was registered in Q2. The days before and after Black Friday and Cyber Monday saw increased activity on dummy Linux servers (honeypot traps), which lasted right up until the beginning of December. SYN DDoS remains the most common attack method, while the least popular is ICMP DDoS. 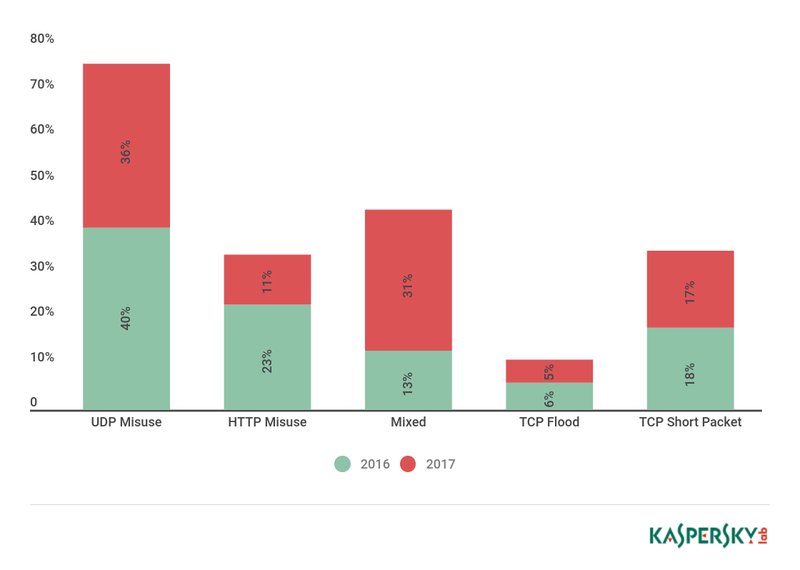 According to Kaspersky DDoS Protection data, the frequency of multi-method attacks rose. In Q4 2017, the share of Linux botnets climbed slightly to 71.19% of all attacks. 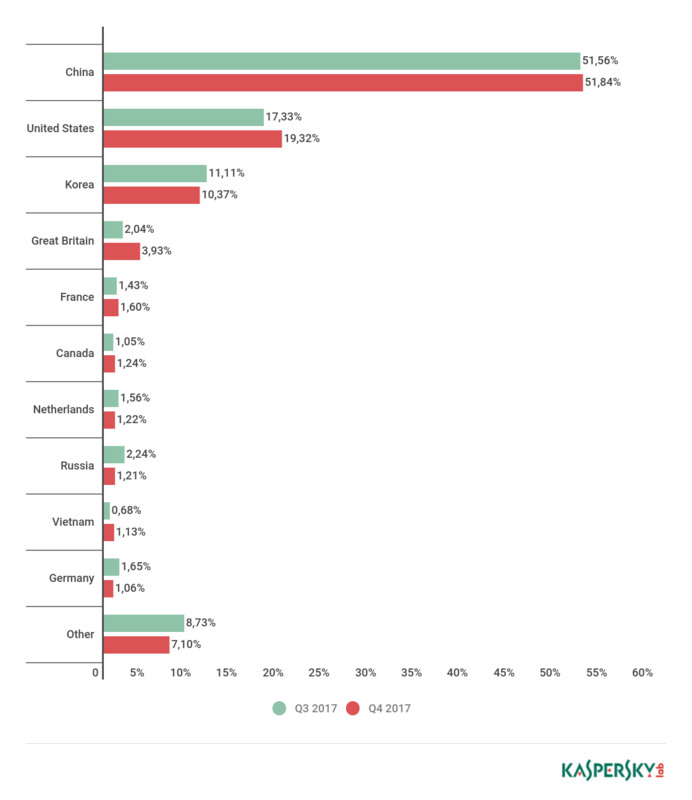 In Q4 2017, DDoS attacks affected 84 countries, which represents a slight improvement over the previous quarter, when 98 countries were hit. Traditionally, China is most in the firing line, although the country’s share of attacks decreased slightly (from 63.30% to 59.18%), approaching the Q2 level. The figures for the US and South Korea, which retained second and third place, went up slightly to 16.00% and 10.21%, respectively. Fourth place went to Britain (2.70%), which climbed 1.4% to overtake Russia. Although Russia’s share of attacks dropped insignificantly (by 0.3%), that was enough to push it into sixth place behind Vietnam (1.26%), which made a return to the leaderboard, squeezing Hong Kong out of the top ten. The percentage of attacks directed against targets in the top ten countries grew in the last quarter (but not by much) to almost 92.90% vs. 91.27% in Q3 2017. The landscape is much the same as before. 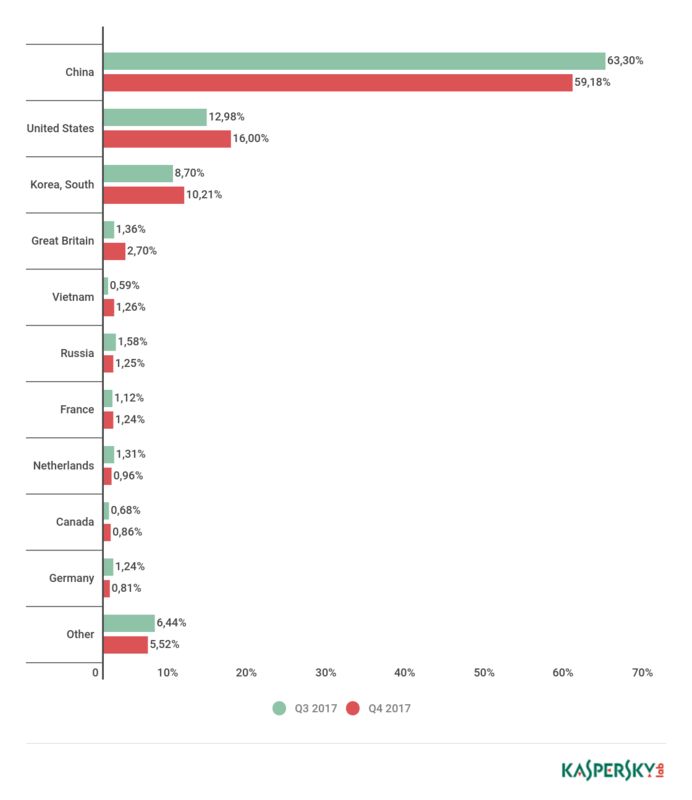 About half of all targets are still in China (51.84%), followed by the US (19.32%), where the number of targets is again nearing 20% after a slight dip in Q3; South Korea is third with 10.37%. Vietnam again ousted Hong Kong from the top ten, taking ninth place with a 1.13% share, while Russia (1.21%) came seventh with a loss of 1%, making way for Britain (3.93%), France (1.60%), Canada (1.24%), and the Netherlands (1.22%), whose figures did not change much against the previous quarter. 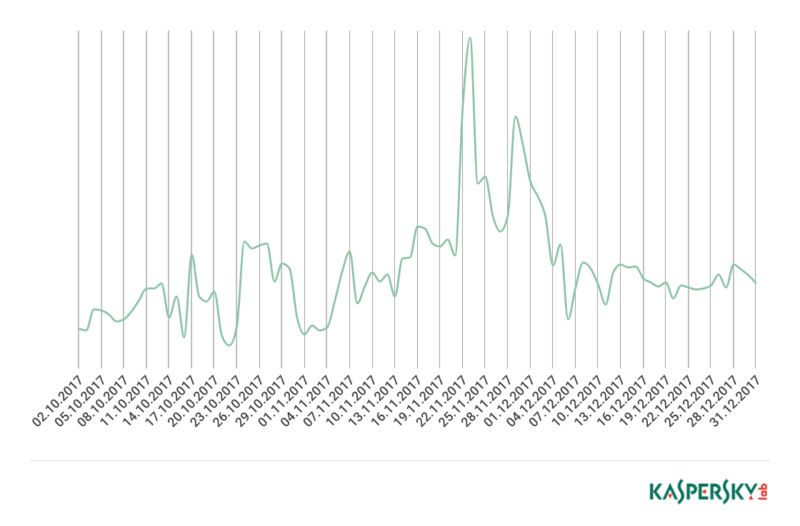 Statistical analysis of specially prepared Linux servers — so-called honeypot traps — shows that peak botnet activity this quarter occurred during the pre- and post-holiday sales. Feverish cybercriminal activity was clearly observed around Black Friday and Cyber Monday, dying down by the second third of December. The most significant peaks occurred on November 24 and 29, when the number of individual IPs storming our resources doubled. Some increase in activity was also observed in late October — most likely Halloween-related. Such fluctuations point to attempts by cybercriminals to boost their botnets in the run-up to major sales. Pre-holiday periods are incubators of cybercriminal growth for two reasons: first, users are less discerning and more likely to “surrender” their devices to intruders; second, the prospect of a fast buck makes it possible to blackmail Internet companies with lost profits or to offer one’s services in the cut-throat struggle online. In Q4, the share of SYN DDoS attacks decreased (from 60.43% to 55.63%) due to less activity by the Linux-based Xor DDoS botnet. These attacks still rank first, however. 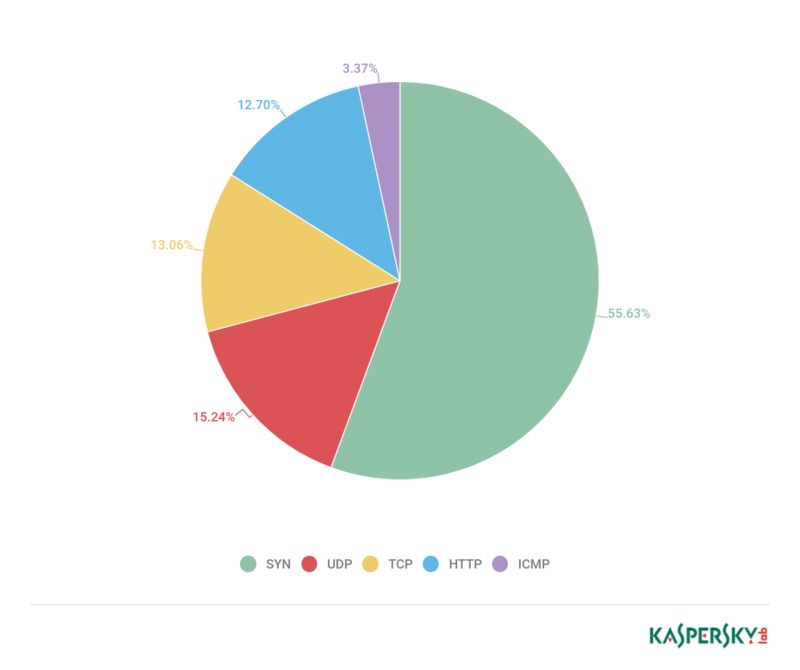 The percentage of ICMP attacks (3.37%), still the least common, also fell. The relative frequency of other types of attacks increased, but whereas in the previous quarter TCP attacks ranked second after SYN, UDP overshadowed both these types, rising from second-to-last to second-from-top (in Q4 UDP DDoS accounted for 15.24% of all attacks). 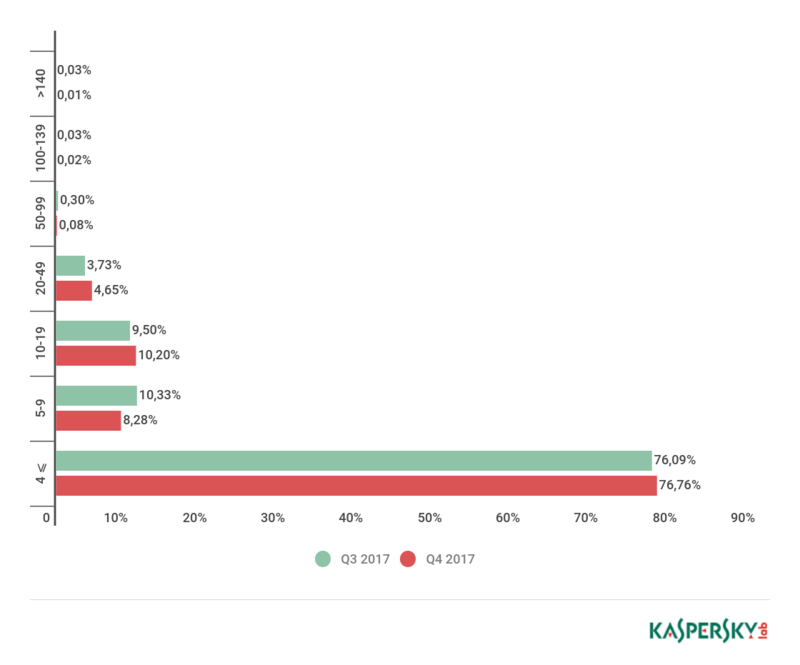 Kaspersky DDoS Protection annual statistics show a decline in the popularity of DDoS attacks involving only pure HTTP and HTTPS flooding. The frequency of multi-method attacks rose accordingly. Nevertheless, one in three mixed attacks contained an HTTP or HTTPS flood. This may be due to the fact that HTTP(S) attacks are quite expensive and complex, while in a mixed attack they can be used by cybercriminals to increase the overall effectiveness without additional costs. The longest attack in Q4 was significantly shorter than its Q3 counterpart: 146 hours (about 6 days) vs. 215 (about 9). That’s barely half the Q2 and 2017 record of 277 hours. Overall, the share of longish attacks continues to decline, albeit insignificantly. This also applies to attacks lasting 100-139 hours and 50-99 hours (the shares of these categories are so small that even a change of 0.01% is news). The most common are still micro-attacks, lasting no more than four hours: their share rose slightly to 76.76% (vs. 76.09% in Q3). Also up was the proportion of attacks lasting 10-49 hours, but again not by much — about 1.5%. The top three countries by number of C&C servers remained as before: South Korea (46.63%), the US (17.26%), China (5.95%). Yet although the figures for the latter two climbed slightly against Q3, China had to share third place with Russia, which gained 2%, the reason being that despite the fact that the leaders’ share changed insignificantly percentage-wise, in absolute terms the number of C&C servers detected in all three countries almost halved. This is at least partially due to the termination of many Nitol botnet admin servers and the less active Xor botnet. On a separate note, this category’s top ten welcomed Canada, Turkey, and Lithuania (1.19% each), while Italy, Hong Kong, and Britain departed the list. 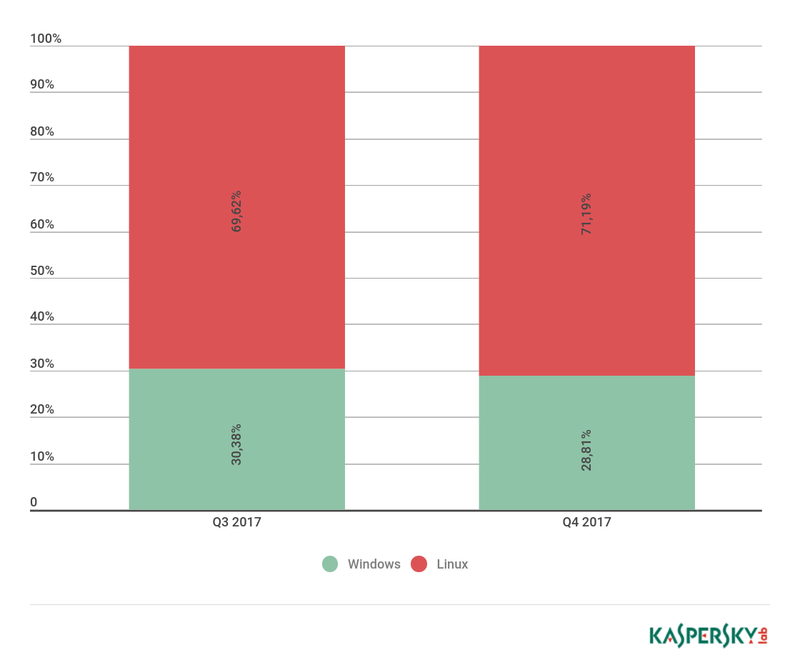 The steady increase in the number of Linux-based botnets continued this quarter: their share now stands at 71.19% against Q3’s 69.62%. 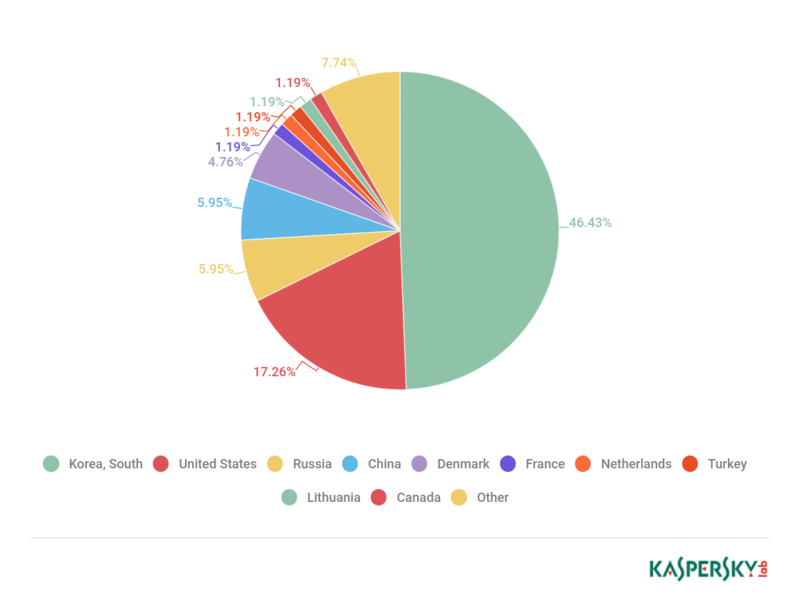 Accordingly, the share of Windows-based botnets fell from 30.38% to 28.81%. Q4 2017 represented something of a lull: both the number and duration of DDoS attacks were down against the previous quarter. The final three months of 2017 were even calmer than the first three. Alongside the rising number of multicomponent attacks involving various combinations of SYN, TCP Connect, HTTP flooding, and UDP flooding techniques, the emerging pattern suggests a backsliding for DDoS botnets in general. 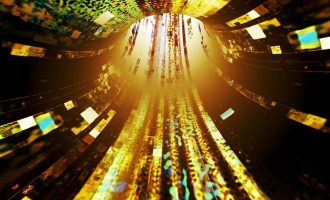 Perhaps the economic climate or tougher law enforcement has made it harder to maintain large botnets, causing their operators to switch tactics and start combining components from a range of botnets. At the same time, the increase in the number of attacks on honeypot traps in the runup to holiday sales indicates that cybercriminals are keen to expand their botnets at the most opportune moment, looking to grab a slice of the pie by pressuring owners of online resources and preventing them from making a profit. In any event, the DDoS spikes around Black Friday and Cyber Monday were a salient feature of this quarter. Another aspect of the late fall/early winter period was the continued attacks on cryptocurrency exchanges in line with the trends of the past months. Such fervor on the part of cybercriminals is not surprising given the explosive growth in the price of Bitcoin and Monero. Barring a collapse in the exchange rate (short-term fluctuations that only encourage speculators do not count), these exchanges are set to remain a prime target throughout 2018. What’s more, the last quarter showed that not only are DDoS attacks a means to make financial or political gain, but can produce accidental side effects, as we saw last December with the junk traffic generated by the Lethic spam bot. Clearly, the Internet is now so saturated with digital noise that an arbitrary resource can be hit by botnet activity without being the target of the attack or representing any value whatsoever to the attackers.